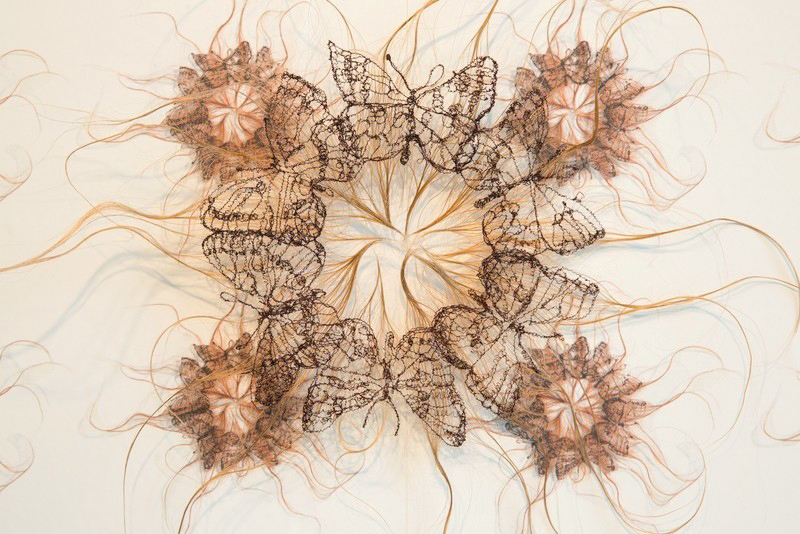 ANDY MAUERY constructs delicate crowns, curtains and clouds from human, acrylic and horse hair. Shed regularly and replenished anew by the body, hair highlights the impermanence of life. 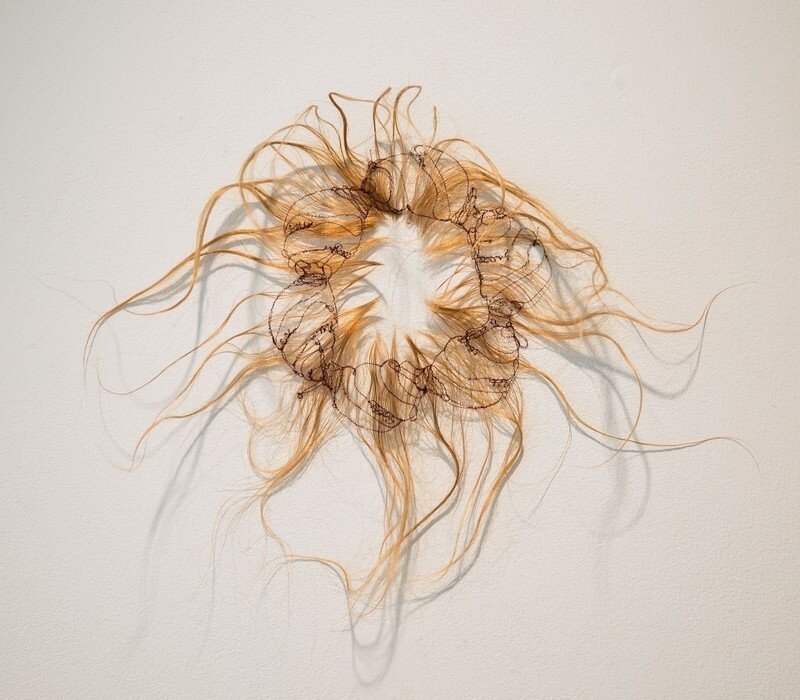 In her recent work, human hair is just barely held together by thread drawings of extinct and endangered species. These fragile objects point to our interconnectedness and remind us that we, too, are not immune to extinction. Andy earned her BFA from Indiana University of Pennsylvania and her MFA from West Virginia University. She has been at artist-in-residence at Haystack Mountain School of Crafts, Vermont Studio Center and Tesuque Glassworks. In 2017, she won an Artist’s Resource Trust Fund Individual Award from the Berkshire Taconic Community Foundation, which funded the work in her upcoming solo exhibition devolve. The show opens in the summer of 2018 at the Lord Hall Galleries at The University of Maine. Currently she is an Associate Professor of Art and the Foundations Coordinator at The University of Maine. Andy lives in Veazie, Maine with her husband, son and two nocturnal kittens. OtherPeoplesPixels: You’ve worked with hair for many years. When did you first use it in your practice? Andy Mauery: I think the first fully realized works that used hair came near the end of grad school, although it had been part of my sketching practice longer. I’ve always had braids lurking around—in hair, different fibers and drawings. One series of pieces was based on fishing lures, but spoke more to luring human attention, looking at some cisgender society roles and mating rituals with a bit of skepticism/cynicism, and some humor. So I made people-sized lures of steel and fibers and turned the hair/fur—pretty common on fly fishing lures—into human hairdos. With the more recent rapunzels, I went back and indulged myself in making bigger versions of works that I have been repeatedly remaking for years in smaller, varied formats. OPP: How do you think about the hair materially? 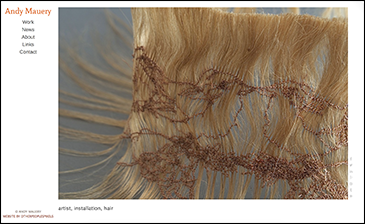 AM: As a material, hair is simultaneously an extremely personal part of each of us and a widely shared mammalian feature. There’s my hair, which I groom in a manner that culturally address a sense of self in many ways. And then there are more than 5,000 species of mammals that, yeah, all have the same stuff, yet it’s considered so completely, utterly foreign and “animal.” Many artists have tapped into the politics of hair. It’s complex and very real. I have frizzy auburn hair, and it has garnered a surprising amount of attention, both positive and negative, from the time I was very young. My paternal grandmother had a beauty shop, too, and I loved it when she let me style this one ratty, mod auburn wig. OPP: The most recent hair work is crowning glories. 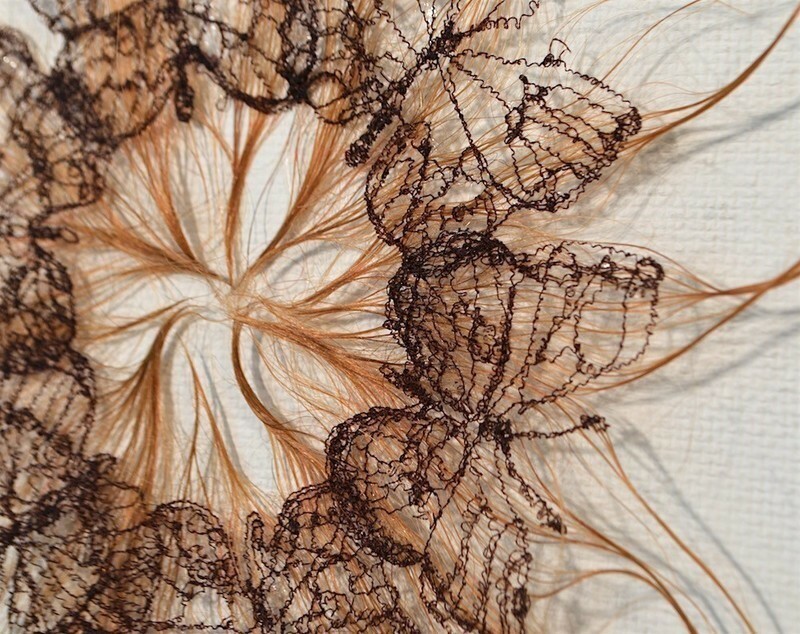 Can you talk about the juxtaposition of human hair with the stitched outlines of extinct butterflies, snails and mussels? AM: The crowning glories, an ongoing project, took shape when I was trying to clarify the relationship I have with these species works and simplify my approach. I wanted the works to resonate personally with each viewer, without presupposing an existing empathy with the critters being pictured. I started with really direct representations of or symbols for the central subjects or ideas: power, you/your human body, the species we humans are harming. I worked with this straightforward equation; the human is [combined with] the other species. I was drawing from photos and graphics of various endangered species, including some plants, and started creating tracery layouts and patterns. I experimented with different techniques to hold the works together, including hand and machine stitching, knotting, wrapping, some felting. 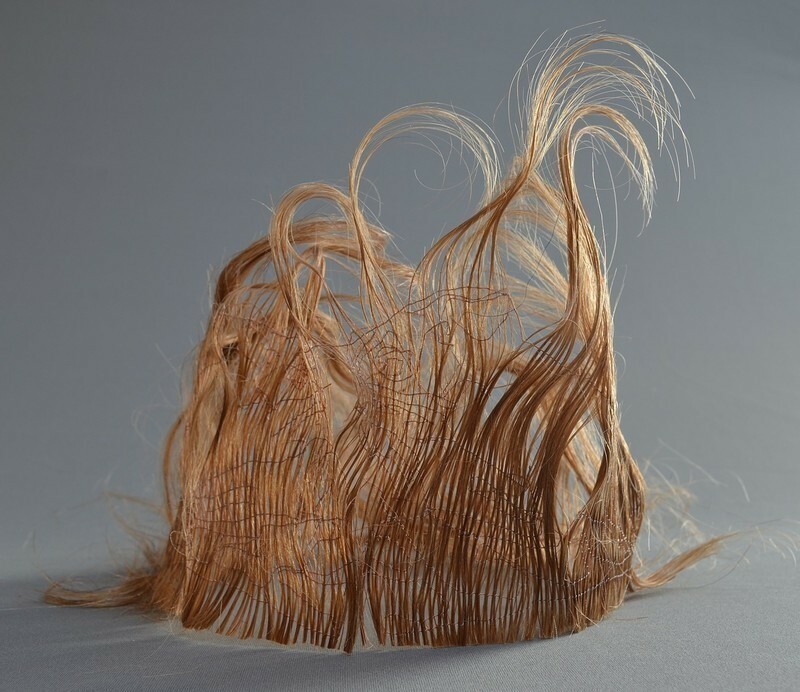 The first of the series that survived my experiments was an actual crown made of human hair, whose form is created entirely of simple silhouette drawings of protected and endangered (and some extinct) species stitched in thread, on/through/around the hair. The hair is this actual DNA record of a person, a wearable memento mori and a self-portrait, all those things and more made into this delicately drawn version of an object representing power. I’ve actually under-engineered the pieces a bit, too, to make sure that they aren’t permanent: they are meant to come apart eventually. I liked the crown works when they were flattened out as patterns, prior to being shaped, so I’ve moved some of the later versions of the series into wreath-like wall pieces, where the repeated butterflies and snails can be more clearly seen. So they are also these contemporary versions of the Victorian mourning jewelry, lamenting the mussels, plants, moths that we are wiping from the earth. A Species of Special Concern: Northern Leopard Frog (Rana pipiens), 2017. Human hair, mirror vinyl, petri dish, water, watercolor pencil, soluble starch. Frog is life size. OPP: What role does fragility play in your practice? AM: Plural roles, definitely, as it is entwined in so many aspects of my practice. Addressing the physicality first, at times I am so intent on working right up to the edge, as if I have to find out first just how far a material can be pushed before it fails. I have so many examples of objects that didn’t survive their own making, when I pushed just a bit too hard. Or sneezed on them. 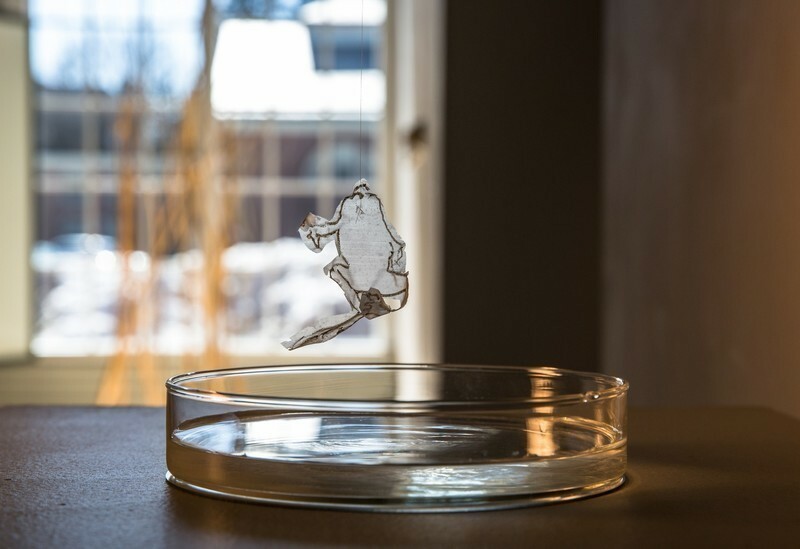 It turns out that a frog made of starch does, indeed, dissolve in those circumstances. The crowning glories are the husky, strong works in my oeuvre, comparatively. I was talking with an artist friend about having a hair work badly damaged in a shipping accident, and when she suggested some tougher materials, I said, “oh yes, on it already. I’m doing a collaboration in glass.” Then I heard the sentence outside of my head, through her laughter: when glass is your “tougher” material. I’m drawn to materials and structures that are vulnerable, and delicate, and ephemeral. Of course it’s lovely when they are paradoxically strong and fragile, too. Horsehair is a great example. That seeming contradiction is what I keep poking at with each sculpture, drawing, installation. I want materials that degrade and age, that have a life span, that need to be cared for to survive, that are analogous to the subject matter or theme of the work. Fragility and mortality are really driving the train, so to speak. Years ago I worked with these same ideas through the lens of boundaries, how we imagine, create, enforce boundaries out of ignorance/unknowing/fear, instead of trying out new ways of experiencing where we as individuals start/stop within our world. Now I continue working on those same concepts but with a shift in perception, still acknowledging my impulses toward the phenomenological and ontological, but now stepping more firmly into what a friend identified as, “good, old-fashioned ethics.” I sometimes wonder if my approach has led me to materially working my way through my own clumsy understanding of Philosophy 101 coursework, manifested through studio practice. If so, I embrace it, with general apologies to philosophers everywhere. OPP: Human mortality and animal extinction are themes in your work. Does one concern you more than the other? AM: Is it too irreverent to say my level of worry between the two is comparing apples and oranges? Human mortality became more of a concern when I became a parent and as I lose a continually and irreversibly larger number of friends and family to human mortality. We get such a short time on earth, even the most long-lived of us; it’s healthy to use that time well. At this point, I don’t worry about it every day, but it certainly shapes my actions. The human condition, you know…we work our way outward from our biological and self-concerns to eventually—in theory—worrying about how our societies work and how they impact the environment. OPP: Are you concerned with human extinction? AM: I do have real, daily concern with animal and human extinction, and those two are inextricably linked. After an incalculable number of animal species die, we humans die. I believe that they have a right to live whether their deaths impact our future survival or not. But for those who don’t think that bats, for example, deserve that consideration, perhaps you could get behind supporting them as a part of the biodiversity that sustains all life? Science has made a very strong case that humans are primarily responsible for the current extinction crisis, this “sixth wave” being unlike the naturally occurring mass extinctions in the sheer numbers of species lost to avoidable conditions like the introduction of invasive/exotic species, habit loss due to a wide variety of land practices that result in pollution and destruction. And of course there is global warming. Our ability to address those big questions involved in the human condition—are we made to be selfish, can we be altruistic, should we live in hierarchical societies, how do we treat the environment—affect our chances of making it as a species. We can’t really survive as humans without non-human species. There is no realistic scenario that supports that; we are part of a vastly complex system of living things. extinction as parlor game, 2017. Wallpaper, endangered Maine butterfly stitched in thread on human hair, insect pin, styling products. paper is 11' high. OPP: How do viewers respond to your work? AM: Some people are really drawn to them and find them beautiful and strange. Others get very angry with these works in gallery shows. They say things like, You’re allegedly so upset about this, but you’re showing bats made of hair in a gallery. This is terribly—choose one—entitled, mercenary, elitist, timid, limited, inefficient, preaching to the choir, naïve … Social and political activism takes place in many venues. It must. It has a lot of different forms; it must. These works are not my only actions towards halting species extinction, habitat degradation, but they are a portion of it. OPP: Do you have a favorite piece by another artist? AM: So many favorites. . . there’s an ever-changing list of faves for different reasons, I will give you some currents. An artist and scientist who works with the threat of extinction, Brando Ballengée’s Collapse is so beautiful and threatening and sad. It’s thousands of preserved species in gallon jars stacked in a pyramid, in response to the damage to the Gulf of Mexico following the Deep Horizon spill. 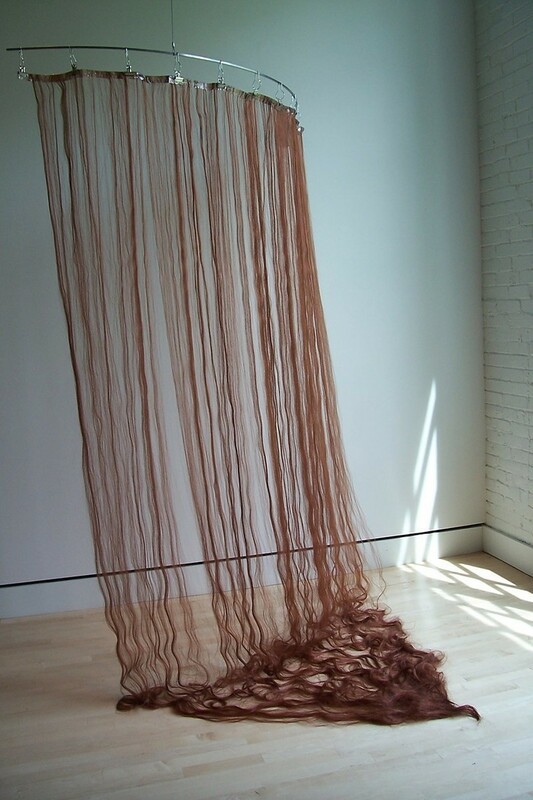 Leonor Antunes' I stand like a mirror before you (2015) for her her brilliant riff on Modernist forms and her deep forays into structure, I love grids, nets, knotted strings and often use them as well. Her work is often so clean and restrained, and politically on point about women artists’ roles to be both practical in effect and socially/politically radical. Speaking of socially active artists, I am really looking forward to showing this summer with elin o’Hara slavick, she does stunning work including a series of cyanotypes done in Hiroshima with objects that were left after the A-bombing in 1945. They are like exquisite, blue x-rays of loss. OPP: What's your favorite piece of your own work? Consider the difference between most successful in terms of audience response versus your personal experience making the piece. AM: The crowning glories are ok with me right now. I’m pretty invested in them, and audiences are responding in varied but strong ways, which is pleasing. But I feel some of my curtains have been the most successful in terms of audience response, such as the two installations in the Atmospheric Conditions exhibit. They are large, visually transparent screens that sway with air currents, can be touched, they reference the body in somewhat odd but still accessible ways. My personal experience making them has, well, pros and cons. For example the materials are very tactile and pleasing to handle, which is great because they take some time to construct so there is plenty of handling opportunity. They are also quite frustrating to make because in most of the studios I’ve worked in, and certainly in my current studio, the ceiling is not high enough to build one vertically, or hang it after initial construction to work on; so the logistics are somewhat involved, and I don’t get to see if it’s really worked until it’s installed into the taller gallery space. I’m currently making a crowning glories version of a curtain, may as well go all in and try to merge the two. To see more of Andy's work, please visit andymauery.com.